1 Preheat the oven to 180°C, gas mark 4. Grease and base line 2 x 20cm sandwich tins. To make the marzipan, put the pistachios in a food processor and blitz until finely ground. Add the almonds, caster sugar, icing sugar and the egg white and blend to a paste. 2 For the cake, put the butter, sugar, lemon zest, eggs, flour and baking powder in a bowl and beat with an electric whisk until pale and creamy. Beat in the lemon juice and spoon a quarter of the mixture into each of the tins. Level the surface. Halve the pistachio marzipan and roll out each piece on a surface dusted with icing sugar until slightly smaller than the tins. Press gently over the filling in each tin and cover with the remaining mixture. 3 Bake for 35–40 minutes or until risen and just firm to the touch. Loosen the edges of the cakes with a knife and transfer to a wire rack to cool. 4 For the butter icing, beat the butter with the icing sugar until light and fluffy then beat in the lemon juice. Use to sandwich the cakes together on a serving plate. 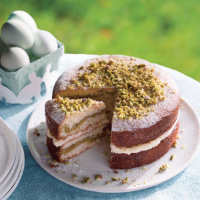 Dust the top lightly with icing sugar and scatter with chopped pistachios to decorate. Click here to watch this recipe being made. This recipe was first published in Mon Mar 02 16:19:55 GMT 2015.